While the team's away, you guys can play! 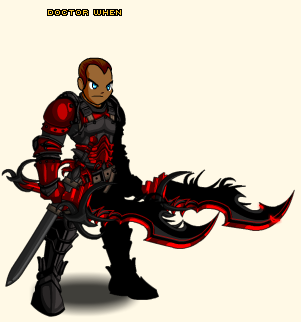 *Except the female version of Dage's Paragon Plate. But because we promised the armor sets if you got his war meter to 100% by Friday, we wanted to get that to you as soon as possible! Fight Dirty to Clean Up Lore! Side note: The way Samba animated this week's cutscenes is INCREDIBLE! The expressions are awesome, but it's how she did the bubbles flying that really makes the cutscenes shine for me! If you agree, show her some love on Twitter - Samba's Twitter - or let her know on the forum! Normally, the theme for Quibble's gear revolves around the current main storyline in the game. But since he was in town while WE were OUT of town, we thought he might be able to procure some dragon-themed gear in honor of Dragon*Con! Talk to him this Friday to /equip the color-custom Prismatic Kahn of Dragons Set (for ACs) or the member-only non-CC Kahn of Dragons Set! Dage may have lost the war for the Underworld, but his followers achieved a different kind of victory last night. We set you all a challenge - to get Dage's war meter to 100% by release time on Friday and you BEAT it! Pushing on after defeat in order to reach a goal takes determination, and you Legion members and Dage-mercenaries proved you've got it! 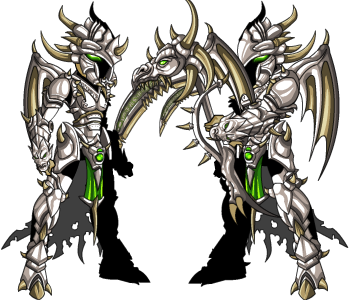 NOTE 2: The Paragon Plate and the Legacy of Nulgath Armor will leave September 21st! All of the other war gear going rare leaves on September 4th. See what that list includes in this Design Notes post! To combat confusion over why people are either not getting the newsletter or not getting their power gem, we've removed the Power Gem link in this week's newsletter. We will add a way to get more Power Gems into the game itself as soon as we're back from Con! To repeat: you should NOT see a Power Gem link in your Newsletter this week. We will get you a reliable way to receive Power Gems next week! Remember: redeem the Artix Entertainment gamecard from Target stores before the end of August 31, 2012 (today) to unlock the Bullseye Spear! The 2,000 AC version of the spear Valencia is selling will also be removed at the end of the night. 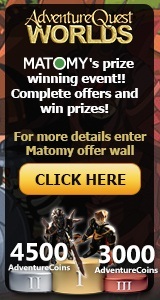 Complete at least one offer through our Matomy AExtras promotion by September 2, 2012 to complete for a chance to win the grand prize: a combo pack of the black Artix and Sepulchure action figures! You can also win either 3,000 or 4,500 ACs! There is SO much to do, even more to see, and best of all, we get to meet some of YOU guys! I've talked to so many players already and can't wait to meet more at tomorrow's Panel! If you're in the area tomorrow, we hope you'll stop by the Panel! It's at the Hilton Atlanta Holtel in "Grand Salon E" at 5:30PM. We'll have prizes, teasers of what's going to happen in our games, and SO much that we haven't planned! Everyone who stops by the Panel and signs up will get an epic in-game souvenir of their visit! 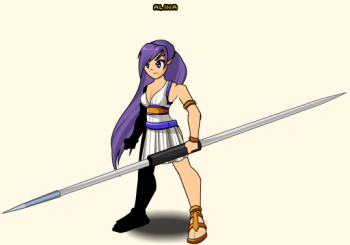 If you can't come, though, find a friend with the 2012 Dragon Con code and then talk to Valencia in /battleontown to get the FREE Chainfire Blade! Enjoy the release! I'm going to go track down Cysero and Rolith. We need to make sure Artix doesn't slay ALL the zombies in Atlanta or there will be none left to make more epic TV shows. His new gear will make you ROAR with delight! 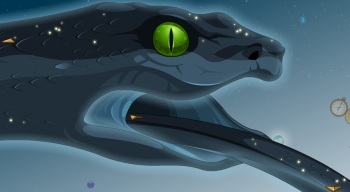 Quibble's third and final update releases THIS Friday while most of the AE team is at Dragon*Con! To celebrate all things draconic, Dage created a set of dragontastic new gear for you all! This weekend you'll be able to /equip the color-custom Prismatic Kahn of Dragons Armor (for ACs) or the member-only non-CC Kahn of Dragons Armor! Along with the armor, you can also purchase either the color-custom or member-only (non-CC) Axe of Boneshattering! And don't forget the Unleashed Dragon Set made by Solrac! 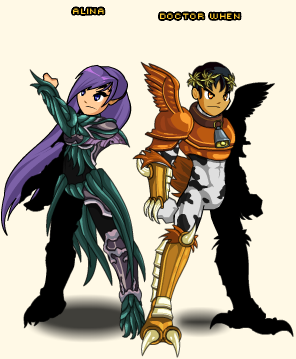 Quibble will have 2 helms, a cape, daggers, a polearm, and the armor in stock this Friday! Mysteries of the Cleric Sisterhood! It doesn't matter whether you're Good or Evil this week, so long as you're committed to saving Lore! /join cleric and talk to Cleric Dawn to begin assisting the Sisterhood with their mysterious mission! What, you thought they just stood in the corner, giving directions and smiling? No way! What did you DO to make Cleric Dawn look like this?! As Lore's foremost Order of Clerics, they're committed to buffing their Purification Magic skills... and scouring the world for what anything out of place! They have a dirty job to do and they'll need YOU to pool your resources with theirs if they're going to successfully cleanse Lore of what ails it! Come on, followers of Dage and members of the Undead Legion! You've got 1.25 million monsters left to slay by Friday before the Paragon Set is YOURS! Dage will sell the Paragon Armor for 2,000 ACs OR for an undisclosed amount of Legion Tokens IF you can get the meter to 100% before the end of the week! You've got a little over 45 hours to go... BATTLE ON! To combat confusion over why people are either not getting the newsletter or not getting their power gem, we've removed the Power Gem link in this week's newsletter. We will return a way to get more Power Gems into the game and newsletter as soon as we're back from Con! To repeat: you should NOT see a Power Gem link in your Newsletter this week. We will get you a reliable way to receive Power Gems next week! Don't forget: redeem the Artix Entertainment gamecard from Target stores before August 31, 2012 to unlock the Bullseye Spear! The 2,000 AC version of the spear Valencia is selling will also be removed on August 31st. Dragon*Con or Bust (a move)! The release is ready to roll live from the Team Suite at Dragon*Con... but I'm not ready to go! 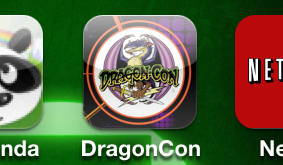 While I go pack, why not read Cysero's Dragon*Con Survival Guide? We hope to see you there! And remember, if you want to get an in-game Con-summately epic DC souvenir (without flying to Con), find a friend** to get your very own souvenir-item code! Just give the code to Valencia in /battleontown to get the gear! ** Or check the official AQWorlds Wiki! Power Gems and Newsletters in the Future! One of the easiest ways to get more AQW newsletters to you all is to send out our newsletter earlier in the week. (That way, we will get them out before so much of our total email allotment is usedup.) Newsletters only go out once a week, so if you don't get one after 2-3 days, you won't get it that week. If your email address was confirmed, Yorumi and Captain Rhubarb are working on a way to get you your free Power Gem today if you didn't receive it yesterday. If your email is confirmed and you DIDN'T get your free Power Gem yesterday, you should see it in your inventory now. Allowing you to re-sign up to receive newsletters after unsubscribing. FIXED! Click on the Newsletter link on the right. In a little while, you should have an email in your inbox! I wanted to get this info out to you all as soon as possible! Check back later today for Design Notes on more Quibble gear previews, news about the Cleric release, and more teasers about Dragon*Con! From talking over Twitter this weekend I found out that a ton of people don't know what DragonCon is, so allow me to drop some knowledge. Since 1987 people have been coming to Atlanta, Georgia (roughly 8 hours drive from The Secret Underground Lab) for DragonCon which has become one of the largest Sci-Fi, Fantasy conventions in the world. They say that they get about 40,000-45,000 people every year but it's closer to 65,000 or 70,000. There are panels about everything from making your own functional steampunk R2-D2, to meet-and-greets with some of the biggest names in TVs, Movies, Gaming and Books. There are thousands of people dressed up as their favorite characters, movie marathons, a sea of tables for table top games like Dungeons and Dragons, card games like Pokémon, Magic and Yu-Gi-Oh, board games like Risk, Settlers of Catan and King of Tokyo. There are several WAREHOUSE sized rooms stocked to the gills with Naruto headbands, Lightsabers (like mine and Yorumi's), Steampunk Goggles, Nerdy T-shirts, Comic Books, Art and anything else you can imagine for sale. There are nightly raves, Firefly themed shindigs, vampire masquerade balls and a constant stream of Concerts featuring people like I Fight Dragons, One-Eyed Doll and Voltaire... and, of course, our own Artix Entertainment Fan Panel. At the panel we get to meet and hang out with some of our biggest fans, we talk about what is coming up, have a question and answer session, Artix usually shows some movies that he's made over the weekend and we usually have a Kick-The-Twilly contest. 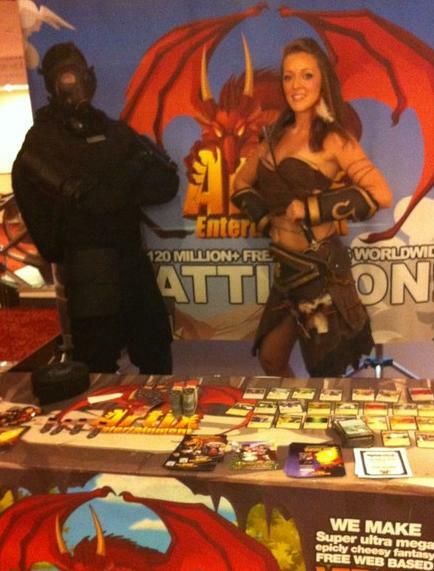 Last year we also had a Battleon Battle card game tourney which was a LOT of fun. Every year we make a special item for those who have come from all over the globe just to hang out with us, but there is also an Artix Entertainment Flyer that we will be handing out that has a code for another DragonCon item for everyone. Just talk to one of your friends who goes to get the code. We've also started a tradition of holding a pizza party in Artix's hotel suite every year. Last year we made too much noise and got kicked out of the room so there are small changes this year. There is free pizza, soda and we get the chance to sit down with you guys and just chill out and talk. We will also have a AE Fan Table in the Hayatt Recency Atlanta, on the lower level (we think). Members of the AE staff (and maybe some AE fans) will be manning the table all through the con. We have made special ribbons to attach to your Con Badges for all three days of the con. Make sure to stop by and grab your ribbons on Friday, Saturday and Sunday and keep us company! A LOT of the famous people at con will sign something for you if you pay them, but lucky for YOU we're NOT FAMOUS AT ALL! All you have to do is give us a marker. We will sign ANYTHING. I mean that. Artix and I signed a dude's neck last year. NOTE: WE DO NOT RUN DRAGONCON! AE has nothing to do with the set-up or funding of the convention. We just attend like everyone else. It's an institution in Atlanta and has been held there for the last quarter century so asking us to have it in YOUR hometown next year impossible on every level. DragonCon starts THIS WEEKEND and as has become tradition I am imparting my knowledge and experience to you all. This is Cysero's Con Survival Guide '12! Extra Strength Energy Shots (Optional). You know, those little bottles of energy booster that they sell everywhere. These things are not great for you, but caffeine and sugar have no effect on MY metabolism and you might be built the same way. Con goes day and night, all weekend long. And it's a holiday weekend. I consider them a necessity during Con. Multi-Vitamins. There are thousands of people from all over the world at con and many of them have brought strange, exotic diseases with them. All these diseases mingle together and become some sort of super-flu affectionately called "Con Rot" that WILL infect you. Keeping your body's defenses up during con severely reduces the time and number of limbs you will lose to the Con Rot. A Mobile Computing Device. Most modern cell phones will do, but you might not get a signal in the underground mazes that connect the convention hotels. Having a wireless card in a small laptop is priceless. A smartphone attached to a 3G network will do (con-tested my iPhone in 2009, worked like a dream). You might or might not Tweet. You might or might not need to check your Facebook and Twitter but your FRIENDS will NEED to contact you about something that you HAVE TO SEE RIGHT NOW! 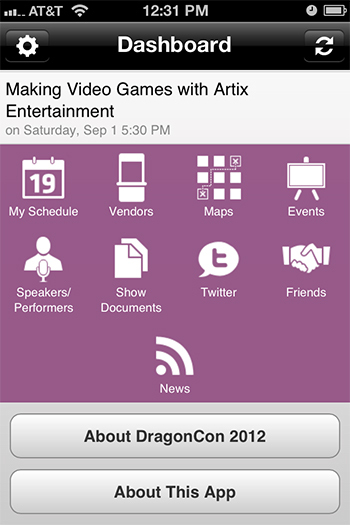 Additional: This year, DragonConhas perfected their free Con Schedule App! The App is for Ipnone and Android phones. It has maps, schedules for panels and speakers, concert times... everything you need to plan your Con experience. An Umbrella or Poncho (Optional). Last year the Venture Brothers panel line was long enough that it went outside the hotel and Alces and I found ourselves in the middle of a rain storm. With all of the weather coming from Tropical Storm Isaac headed toward Atlanta just in time for con, I suggest packing weather protection. A poncho will fit in your bag but an unmbrella makes you look swanky of you rock it right. You're Doing A Release From Con?! Yes. As always we will be running a release from our lap-tops using the hotel's internet. The team is scrambling like mad to get everything ready for the release so all we need to go is hit the GO button. 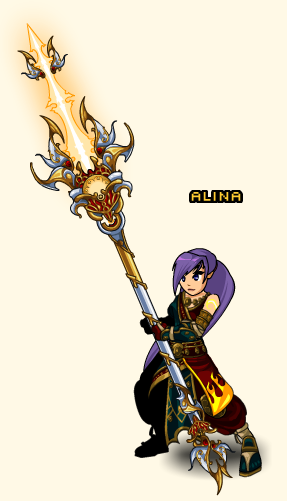 Look for ALINA's Design Notes Post a little later on today for more details! Together, Good and Evil form the Alliance, but as Chaos continues its attack on Lore, it does not move fast enough for Empress Gravelyn! She has grown tired of waiting for King Alteon to order the attack on Chaos. Tonight, she summons you to Shadowfall to test your loyalty. Will you serve Evil and help the Empress save Lore from Chaos... and then rule it? Or will you remain steadfastly Good? You'll need to adventure all over Lore, fulfilling the tasks General Tibias and General Cynari set you in Gravelyn's name. Journey all throughout Shadowfall and then to Yokai, Poisonforest, Lair, and Swordhaven! At the end of the first cutscene, you will need to choose between Good and Evil... and you cannot change your mind once it has been made! The quests you go on, the cutscenes you watch, and the rewards shop you unlock are all based on the choice you make tonight. 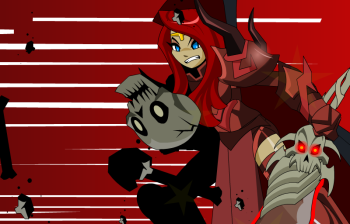 Think hard, Hero, because you are deciding how you will interact with Empress Gravelyn for the rest of this storyline! New Time-Travel Gear in Quibble's Shop! Talk to Quibble in Battleon to see his ALL-NEW Chrono Tripper Armor set and the swankiest, steampunkiest TopHats Lore has ever seen! Confirm your email to get Power Gems! If your Email Status is Confirmed, then you are receiving the weekly AQW Newsletters! Yay! You will then see: "Confirmation email has been successfully sent to your email address." Now, go check your email. Should only take a few minutes to reach your inbox. 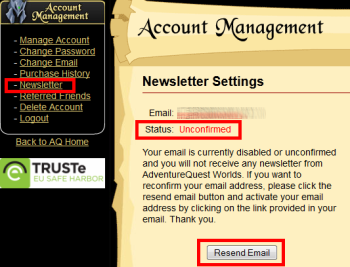 Once you receive the email message from AdventureQuest Worlds MMORPG with the subject =AQW= AdventureQuest Worlds Confirmation, follow the instructions in the email and click the link that confirms you are the owner of the account. Once your email address is confirmed, you will see the message: "Success! Congratulations your email address has been confirmed and your account is now activated. Check the homepage for news about the game. Notice: Email Confirmed Successfully!" One more week for the Matomy AExtras Contest! Our AExtras offer with Matomy is still running! You have until September 2nd to complete at least one offer. The grand prize is a combo pack of the black Artix and Sepulchure action figures! You can also win either 3,000 or 4,500 ACs! Stealing candy, betraying villagers, and undeadifying puppies is mean. But you're Evil, so it works out well. To slay the Shadow Munchers, head down the hall to your left. They're in the room with the Shadowy Beings. Join Poisonforest to slay the bandits. 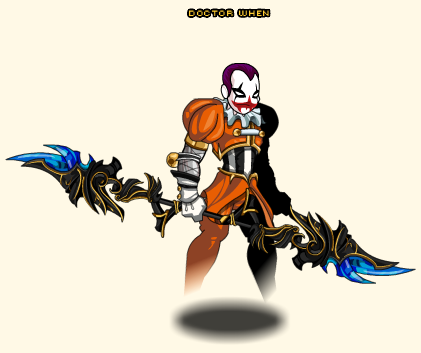 ANY monster with Chaos or Chaorrupted in its name will drop the Chaos Gems to get the Chaos Slayer armor! If you do not see the Chaos Slayer quest available, that will be fixed on Monday. YES, your choice is final. IF you choose to ally with Empress Gravelyn, for the remainder of this storyline, you're Evil. It works the same way for Good/Alteon, too. If you haven't checked out the Lorepedia recently, Beleen's added an AQW Staff List here so you can see the team that makes the game! Get to know the game developers, moderators, and support staff who make sure you have an AEsome time playing AQWorlds! Coming Next Week: Dragon*Con and Clerics! Most of the crew at the Lab and some of our off-site staff are all meeting up at Dragon*Con in Atlanta, Georgia! If you're in the area, come meet us! Because it's a SHOOOOOORT week, we'll be working on the Cleric release this weekend. What secrets does this squeaky-clean Order hide? You'll have to find out next Friday! Buff your INT stats IRL! Everything you ever wanted to know about AQWorlds… and some stuff that you never knew existed… can be found in the Lorepedia! Lorepedia is the official AdventureQuest Worlds Encyclopedia teeming with invaluable information (and lots of pretty pictures!) about Classes, Enhancements, Character Page Badges, Membership Benefits, Moglins, and the Player Handbook. Lorepedia is not meant to replace the awesome AQW Wiki nor step on the toes of the wonderful Wiki team—Lorepedia is just another source of information to help you and your friends become the ultimate AQWorlds hero! So allow me explain each Lorepedia section a bit better! With the new school year upon us, it’s time to attend your classes. But in AQWorlds, YOU get to choose what Classes to master! We’ve got over 50 awesome Classes to choose from, all of which are interchangeable whenever you want (ooohh I wish my school schedule was that lenient!). But with so many Classes with so many Stats and so many Skills, it can get pretty confusing trying to figure everything out. Let Lorepedia be your cheat-sheet instead! The Classes section of Lorepedia breaks apart every Class, explaining what the Class is, where to find it, what Enhancements work best, Base Stats (that is, without any applied Enhancements), and the Skills and Passive Abilities. If you wanna master any Class—and check out all of your available options—head to the Classes section of Lorepedia! Enhancements are magical! And I’m not just saying that because I’ve run out of synonyms for “awesome”—Enhancements really are magical things used to increase your Strength, Intellect, Endurance, Dexterity, Wisdom, and Luck Stats. There are 10 different types of Enhancements that can be applied to your Helms, Weapons, Capes, and Classes (even though they’re called “Armor Enhancements”...what the…?). The right Enhancement can make all the difference between victory and respawn—so read up before you Enhance up! OMGOMGOMG Moglins are sooo totally adorable! =D EEEP! But there’s a lot more to a Moglin than his cuddly fabric softener bear appearance. The Moglins section in Lorepedia briefly explains some of the most famous—and infamous—Moglins found in AQWorlds. More Moglin biographies will be added in the future… because it’s pretty hard to hold an interview when all I do is squeal with delight over the lovable, huggable, squishy Moglins that I cherish so much! 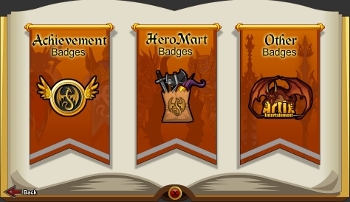 Aside from showing off all your epic loot on your Character Page, there are tons of Badges you can earn throughout your travels in AQWorlds. 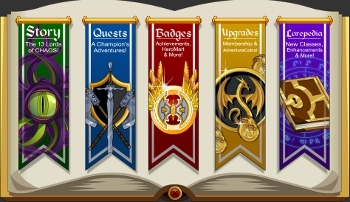 The Badges section of Lorepedia lists every Badge and how you can earn it, from upgrading to a Member to equipping HeroMart items IRL to participating in live in-game events. New Badges are added all the time, so I will try my best to keep up! An ever-expanding World of Quest and Adventure unfolds as you explore AdventureQuest Worlds. The Player Handbook is your guide to all of the features found within the world of Lore, from Player vs Player battles to Interface Icons to different Emotes used in Chat. Since knowledge is power, everyone of every level can benefit from reading the Player Handbook! I've also added an AQW Staff List here so you can see the team that makes the game! Get to know the game developers, moderators, and support staff who make sure you have an AEsome time playing AQWorlds! I need YOUR help to make Lorepedia the best ever! Aside from being natural-born heroes, you guys and gals harbor amazing creative talent and always come up with the best ideas =D I would love to hear your thoughts as to what new Lorepedia sections should be added next! Our wonderful Forums Staff is currently working on creating a “Lorepedia” section on the Forums. Some of the ideas we are tossing around include fan art, screenshots, new chapter suggestions, and class tips & tricks. So start brainstorming with your friends today! And as soon as the Lorepedia Forums is up and running, you can post all of your great ideas and suggestions there. Here are some simple solutions! Power Gems came out a few days ago and everyone loves them! Yay! But no brand-new feature is safe from technical bugs and oopsies, so we are doing everything we can to make sure you receive the Power Gem that’s rightfully yours. Help us help you! Follow these simple steps if you haven’t received the weekly AQW newsletter with the free Power Gem link. 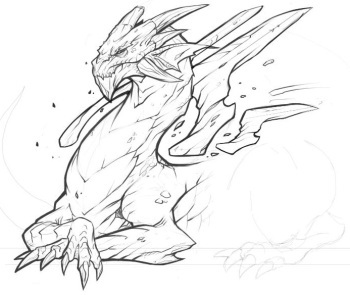 with the subject =AQW= The Span: Dragon of Time! Run a search through your email account using any of the bolded terms above to see if you have the newsletter with the free Power Gem link. If you have multiple accounts on one confirmed email, all of those accounts will get the Power Gem when you click the link IF you've logged in on them in the last year. If you haven't, just log in, then back out, then back in again! You will get the Gem automatically. Hooray for simple fixes! Most likely your email provider blocked the individual message. Search your inbox for =AQW= The Span: Dragon of Time! 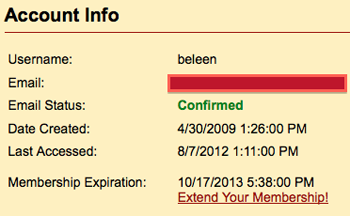 You can also sign-up with a new email using the Account Manager and you'll start getting the newsletter again! You may be clicking an old link, or your email might not be confirmed. This means the data you used was invalid. Make sure your email is confirmed and try again when the next newsletter reaches you. DO NOT KNOW! We are still trying to figure this out. Please post a screenshot on the forums showing that error. Megalops is looking into what could be causing that. Shadows are stirring inside the Empress' Fortress! With Chaos on the move and the Alliance not advancing in their crusade to overcome it, Empress Gravelyn is growing impatient. She needs to move, and soon! This Friday, you will be summoned to her throne room in /Shadowfall. Rob strangers to finance your Empress, save strangers to prove to the Empress that a Good alignment is the right choice... and watch as Gravelyn begins the journey to reclaim her throne in the eyes of ALL Lore! 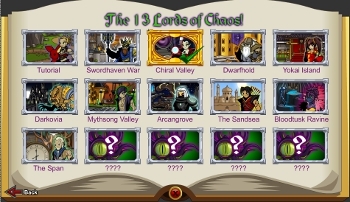 This week's rewards will come in three styles: Evil, Good, (and for those of you who just HAVE to be different) Chaos! Time keeps on ticking into the future... and so do your rewards! 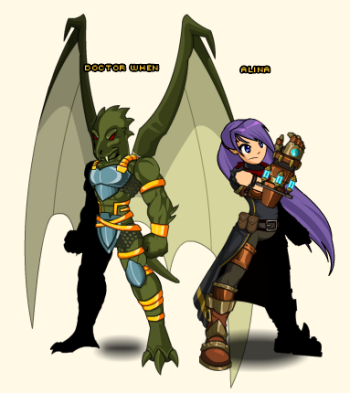 Quibble's shop will be updated just in the nick of time this Friday with: Time Travel-themed gear! Look for more art previews later this week. It sounds like a lot of you are looking forward to getting all of that shiny Power Gem gear that Twilly has in Battleon! The issue is most likely that your email provider blocked the individual message. (It might have been flagged as spam accidentally.) You can sign-up with new email and you'll start getting the newsletter again! To make sure you DO get the newsletters, Captain Rhubarb is going to set up a "Send me a sample newsletter" link to make sure that you receive it. The next week, you'll get an actual newsletter with a Power Gem link! You may be clicking an old link, or your email might not be confirmed. That just means the data you used was invalid. Make sure your email is confirmed and try again when the next newsletter reaches you. Please post a screenshot on the forum showing that error. In the meantime, Megalops is going to look into what could be causing that. Artix Gamecards are still in stock at US Target locations! Redeem your card before August 31st, 2012, to unlock the Bullseye Spear bonus item AND Artix Points! 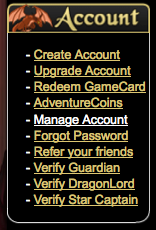 They can be used to purchase AQWorlds membership or Adventure Coins! Can you get to 100% for the Paragon Set? Dage the Evil has been persuaded! If you can get his war meter to 100% before the release time on August 31st (while we're at Dragon*Con! 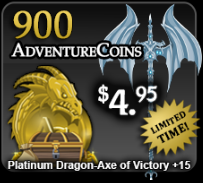 ), he will offer his Paragon Set for Adventure Coins once the goal is reached! How fast can you battle?! Sword of the Legion Shop News! 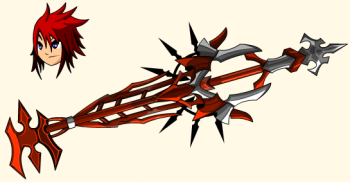 The Sword of the Legion, a reward from The Stranger's quest in /evilwardage, will unlock a shop on Dage's NPC in the future! He's not sure what to put in there yet, so let him know on Twitter what you'd like to see! DragonCon takes place every year in Atlanta, Georgia. It is a weekend long convention (Recommended ages 15+) with 30,000+ attendees... most in amazing costumes. I guess it is really like a weekend long costume party with celebrity guests (walk of fame), panels featuring the casts of your favorite sci-fi/fantasy/etc TV shows, video games, art galleries, table top games, concerts, shopping and... well, check out the schedule on the DragonCon website. 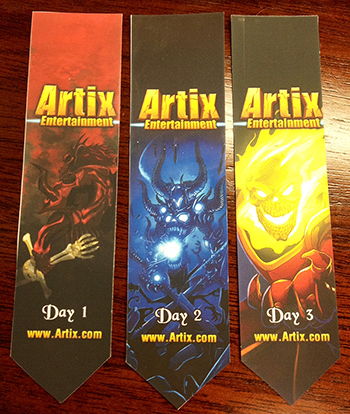 As mentioned in our previous post, the Artix Entertainment team will be attending in force again this year. We will be running a panel and a fan table! Our artist Jemini (pictured above) has like 3 different costumes this year! 3rd Birthday Event almost over! 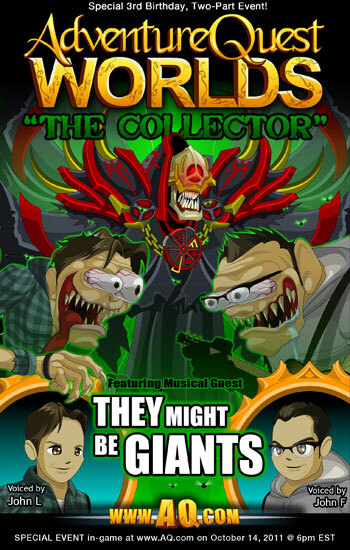 If you haven't played our 3rd birthday extravaganza with guest stars They Might Be Giants yet, then /join collection today! You will only be able to access this event until October 12th, 2012, when we launch our 4th birthday/wedding event! TWO Character page and Book of Lore achievements! By Journeying to the Time Void in The Span! Return to Chaos this week as Iadoa takes you on a journey across Time itself! If you wondered how AQWorlds was created from 3 divergent timelines, then this is the release for you! But can you trust Iadoa? A Chronomancer who has fallen - even in part - to Chaos? How do you know he is leading you onto your path of destiny? Time Travel Fairies are dangerous! Don't blink or you'll miss their attack! Your quest to seek out the Eternal Dragon of Time leads you to the Time Void, but knowledge comes at a cost. Prove yourself to Vaxt Ahas, the Unending, to gain access to the information you seek. Do not taunt the Eternal Dragon of Time! And don't miss the new rewards in The Span's rep shop! The Soul Banisher Armor, the Baconing Mace, Glaive of the Orb Staff, Beams of Celeritas Wings... there is new gear for both members and non-members! And if you take on the Unending Avatar boss and win, there are even MORE rewards to earn! VIDEO BONUS SPOILER*: Click here to see Samba narrate the final cutscene! Hysterical! *Do NOT watch under after completing the release! 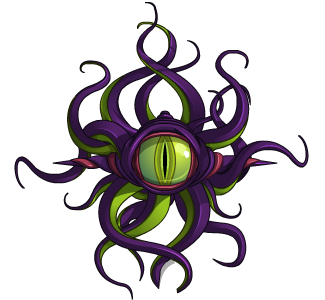 Quibble Coinbiter Returns to Battleon! Quibble Coinbiter is BACK with never-before-seen-slightly-used items items** from your past, present, and future! Dark Caster Class is live! If you're one of the 4,000 people who held onto their Dark Caster armor from Dage's birthday shop a few years ago, then you'll want to /join Shadowfall to begin Dage's Dark Caster Class quest! Brave a terrifying dragon to acquire the priceless artifact Dage MUST have! Bring it to him and the Dark Caster Class will be yours! You must have the original Dark Caster armor to go on the quest. Dark Caster X armor does not unlock the quest. Convince Dage to give you a reward! Dage the Evil has said his Paragon will not be released since his side lost the war. Get the Legion War Meter up to 100% and MAYBE he will change his mind! It couldn't hurt, right? 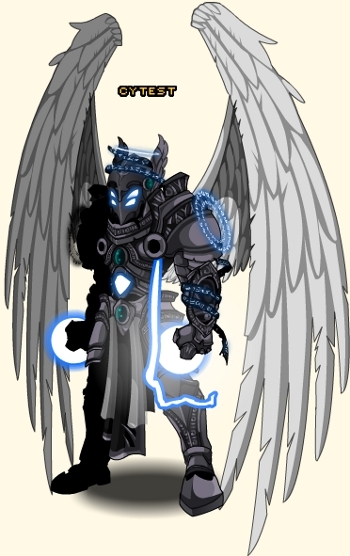 Many, many moons ago when Dage The Evil was still the loyal servant of The Archfiend, he created an armor called Dark Caster. At the time is was the pinnacle of his craftsmanship and many, many people desired it. Through the secret halls and corridors of the internet it was promised to those who obtained this item, that one day in the far-flung future the next evolution of this armor, Dark Caster X would be theirs. Things happen and plans change. Through many discussions and much planning the idea of Dage's Dark Caster X eventually evolved into a class rather than an armor. But people were still howling for the Dark Caster X so the armor was created and released for all. But Dage had not forgotten his promise to those who bear the original Dark Caster. It would be no mere armor that they would inherit, but a full Dark Caster Class with it's own Legion based skills to better serve their master, Dage. Nulgath's army proved too much for the mighty Undead Legion and Dage The Evil has failed in his attempt to overthrow Nulgath. A rift was opened to another world rich with possibility and ripe for corruption. 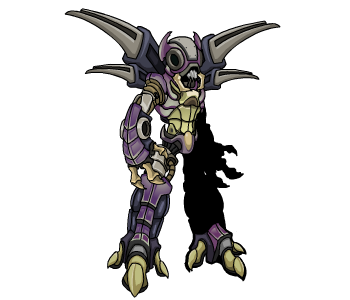 Nulgath has tossed aside the war-torn scraps and left Lore to inhabit, spoil, shape and eventually conquer the rich world of Oversoul. Dage is still nursing his wounded pride and the Underworld is not as enticing as it once was, being given to him a pitiful trophy... a reminder of his great defeat. But his eternal rage still burns a cold, blue flame in what remains of his soul and he has already begun rebuilding his army. The Dark Caster Class finally arrives today and all those who posses the original Dark Caster armor are called to Dage's service once again. The skills will soon be yours to master. As we've mentioned before... a lot... ONLY people the ORIGINAL DARK CASTER armor will be able to obtain the Dark Caster Class. There will be no AC version and no other way to get it. For the most part with AC items like the original Dark Caster armor, you get what you pay for. However, on VERY rare occasions there is an item like this that will allow you to get more than you paid for. You may think it's unfair that you signed up after the original Dark Caster armor had been released or you didn't know at the time that it would unlock anything else but a promise was made and a promise will be kept. Did you really expect fairness from Dage The Evil? 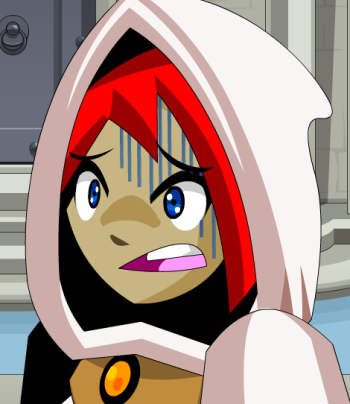 There are only about 4000 people left in AQW who still have the original Dark Caster Class. If you're not one of them, you don't need to read any further. If you are one of the very few people (4000 is a very, very small number of AQW players) who still own your Dark Caster then you probably want to know how you will get the class. Dage tells me that there will be at least one quest and probably some Legion Tokens required to obtain the class from him in Shadowfall. 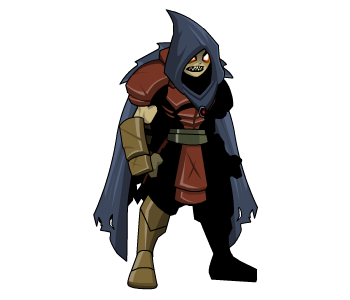 The Dark Caster armor will need to be in your inventory in order to unlock the quest or quests that will grant you the class. You will NOT be required to turn in the armor. You only need to have it in your inventory. Dage and I spoke for a while about what he expected out of the class. Obviously it was to be a caster. Single target DPS with some survivability, but not a tank. He wanted some interactivity which requires his Legionnaires to do more than mash buttons to gt a kill BUT he wanted the skills to have fairly short cooldowns so you had to pay close attention and act quickly. He wanted people to use it in PvP so it needed a guaranteed stun but it had to be a stun for which you worked. Since it is a caster type and all of the skills are magical you should slot this out with Wizard Enh. I think I designed a class that matches all of his expectations. Here are the skills. Magically grip your enemy's soul tighter and tighter. Deals moderate damage, also applies Soul Crush which stacks up to 3 times. Each stack reduces your targets damage further. Soul Crush replaces any stacks of Soul Burn. This class starts off with a moderate damage ability instead of a light one which will make ranking it up a little simpler. The debuff isn't super-powerful but just enough to give you an edge in battle. The real joy in this skill is the 4 second cooldown. The cherry on top comes in the final ability. A blast of charged spirit hits your target for light damage. Also applies Soul Burn which stacks up to 5 times. Each stack causes your target to take more damage. Soul Burn replaces any stacks of Soul Crush. Another damage skill with an even faster cooldown, but less damage than the first still. Another mild debuff but now that you have this skill you are forced to decide which debuff you like better. Again, the real value in this skill comes the last ability in the class. Regain some mana over time at the cost of losing health over time. Also increases your damage output for a short time. You Necromancers will recognize this skill. It makes sense considering the Dark Caster's close ties to the necromantic magic that keeps the Legion up and walking around. When you use this skill your life slowly drains away as your mana slowly refills. Once again, you need to watch your HP bar to make sure that you don't kill yourself but if you juggle this with the soon-to-be-revealed healing skill then you'll be OK.
Do more damage more quickly. A high damage attack with an additional effect. If your target has 3 stacks of Soul Crush applied, they will be stunned for 4 seconds. If your target has ANY stacks of Soul Burn applied, you will be healed over time. Amount healed increases with stacks of Soul Burn. This skill consumes all stacks of Soul Crush or Soul Burn. Those of you who have gotten this far in Skyguard Grenadier will recognize the way this skill functions. In addition to the nice high damage that you get from the skill itself, this skill also has additional properties depending on which of the first two skills you've used. If you have three stacks of the first skill then Legion Strike will stun your target for 4 seconds. You can USE those 4 seconds to get one more stack on them and try to stun lock your foe but you will eventually run out of mana. If you have the second skill stacked then you get a heal which will be progressively larger depending on how many stacks you have of that light damage second skill. Using this skill will balance out dark conversion and you can try to bleed your opponent's life away with light damage (and the rare HIGH damage from this skill) but you lose out on the higher damage from the first skill, not to mention the stun. Here are a few tips: I find that 4 stacks of Soul Burn is plenty to keep you alive through combat AND Dark Conversion. I won't wast time on the 5th stack unless you're planning something big.Don't be afraid to mix up which skills you use but remember that every time you use one it negates the stacks of the other so think ahead. Rarely, you will focus all of your dark power into one MASSIVE damage attack, but it will consume all of your mana and half of your remaining life. This is a VERY large attack but it's balanced out by the fact that it pretty much leaves you open to any incoming attacks. I would carry a few potions around if I were you. That's it. It's pretty fun to play since it keeps you on your toes and it's a good boss class and can be a decent PvP class if you play it right but I don't think that anyone will be complaining that it's over powered. We've got more than the class coming tonight. The next chapter of The Span is coming plus Quibble is on the way with a bunch of items pulled from the timestreams of our other games, and we have a new Matomy (AExtra) offer starting tonight which could win you several thousand ACS OR the grand prize of a set of the rare, collector's edition Black Artix and Sepulchure action figures! Be sure to come back clear to the release and read Alina's Design Notes on tonight's release for more details! Ready to earn some awesome free items? Did someone say FREE items? Oooh yes I did—and here is everything you need to know about Power Gems, what they do, how you get them, and the amazing free items you can get. Read on my friends! 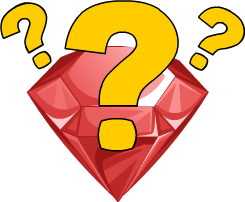 A Power Gem is a time-sensitive special item that is awarded to you for checking the weekly AQW newsletter. Power Gems are stackable, meaning that each week you can get another Power Gem just by reading the AQW newsletter. Really, it's that simple! Furthermore, Power Gems are marked as an “AC Item,” so that means you can store them in your bank for free and forever (Inventory Bags rejoice!). When you have collected enough Power Gems, you can buy epic items from the Power Gem Shop that Twilly, the lovable red Moglin, is opening up in Battleon. The fun begins this Friday! What are Power Gems used for? How do I get Power Gems? Earning a Power Gem is as simple as reading the weekly AQW newsletter! A new section in the newsletter, cleverly titled “Power Gems,” includes a one-of-a-kind link that will give you 1 free Power Gem in AQWorlds. You can also follow the “Claim your free Power Gem now” link under the “Your Info” section of the newsletter. From here on out, a special Power Gem link will be included in every weekly newsletter, so as long as you have a Confirmed Email—your real email that you check everyday—you can get a free Power Gem every week. How do I know if I have a Confirmed Email? 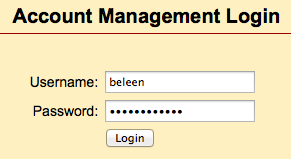 On the Account Management page, enter your Username and Password, and then click Login. Here you will see your Account Info (or in this case, mine! 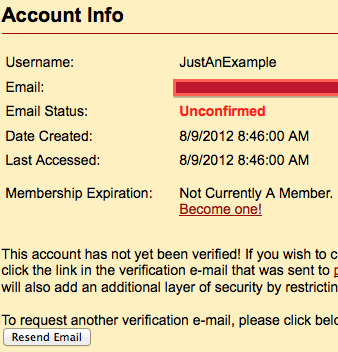 ), and the Email Status will determine if your email is confirmed or unconfirmed. Easy fix! All you have to do to Confirm your Email is click the “Resend Email” button to have another confirmation email sent to your email address. 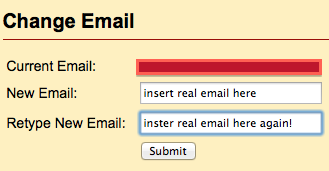 When you click on the link provided in that email, you will have successfully Confirmed your Email! Gratz! If the Email on your account is not the email you check regularly, it’s time to update it so that you can start earning free Power Gems! 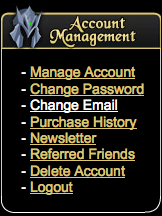 After following the 3 steps above (Manage Account-->enter Username and Password-->Account Info), click on the “Change Email” link under the Account Management section on the left of the screen. Remember how I said waaaaay up there that Power Gems are time-sensitive special items? The Power Gem link in your newsletter is only valid for a limited time! This means you have to read the weekly AQW newsletter as soon as you get it to insure that you receive the Power Gem that’s rightfully yours. The Power Gem link in the weekly newsletter is only good for 21 days. If you forget to check your email for awhile, you'll need to click the Power Gem link in the oldest newsletter first. If you click the Power Gem link in a newer email, the older Power Gem links won't work. Also, if the newsletter is too old—over 3 weeks old—the Power Gem link won’t work either. You will have to wait until the next week’s newsletter comes out with a new Power Gem link. This is why it is super important to have a real Confirmed Email so that you don’t miss out on getting your free Power Gem! And, of course, all of the epic Power Gem items that can be obtained! Still need more help confirming your email? Remember: If you have multiple accounts on one confirmed email, all of those accounts will get the Power Gem when you click the link IF you've logged in on them in the last year. If you haven't, just log in, then back out, then in again! You will get the Gem automatically. Follow me to the Account Manager to Confirm or Update your Email Address! The war is almost over... the rewards almost here! In the biggest, EVILLEST war AQWorlds has ever seen... we're about to see a WINNER! Nulgath's Abyssal Army has the war meter at 91% while Dage's Undead Legion has reached 54%. The mercenaries fight for BOTH sides... and can switch at any time. Will the current front-runner remain in first place? YOU decide! 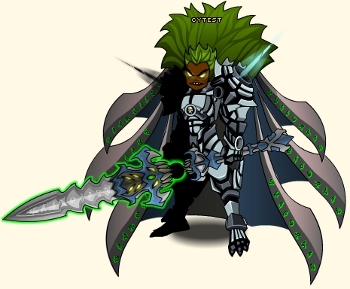 Should he win, Nulgath offers the color-custom Legacy of Nulgath set to all those who have fought for him during this clash of Evil Commanders! To claim the entire set you will need: 50 Diamonds of Nulgath and 50,000 gold! The set is non-member, so all of Nulgath's loyal followers can show their allegiance. Should Dage win, he offers the legendary Paragon Set! For many years, his warriors have fought to possess this epic gear. What will become of it if he loses?! If you don't want to find out, then /join evilwardage and BATTLE ON! If he is victorious, the Paragon Set will sell for 1,000 Adventure Coins so that his most loyal followers can show their allegiance. If you are one of the lucky few who held on to your Dark Caster armor, then you've got a fun time coming! To unlock the Class this Friday, you'll need to visit Dage and undertake a perilous quest! ONLY those who possess the original Dark Caster armor will be able to go on this VERY difficult adventure, but the reward will be the epic Dark Caster Class! Face the Dragon of Time this Friday! You cannot fight the Dragon of Time because his death allowed you - and your world - to live! But you CAN learn what he sacrificed to allow you to be! This week, gain the trust of Vaxt Ahas, the Unending, the universe-snake which inhabits the Time Void. Prove your worth and show that you have what it takes to walk amongst the Ages. If you have what it takes, then you will see how Galanoth came to slay the Dragon of Time - what took place before the battle and how its death created the AQWorlds you know today! Quibble Coinbiter is almost here! 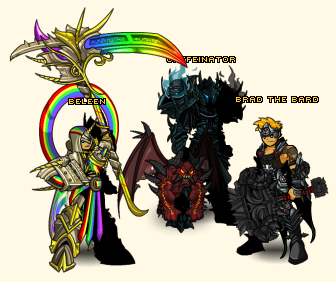 Don't forget to stop by Quibble Coinbiter's shop in Battleon this Friday! His chest is chock-full of gear taken from your past, present, and future... all contained within our current Chaos zone, The Span! You'll be able to purchase these sweet member-only pets and much more! Twig wif a Fwish and the Gween Pet! * Follow the steps listed here to unlock your Bullseye Spear. Just look for the Bullseye achievement in your Book of Lore instead of the Flamestop. Gravelyn takes control! With an entire army of Undead and Evil followers, no self-respecting Empress sits around and just... waits. Next Friday, return to Shadowfall to help Gravelyn use Evil to bring Order out of Chaos! The Sisterhood of the Dishpan Hands has many secrets! Do YOU know why these helpful clerics are stationed around Lore? What are they waiting... and watching... for? Journey to their Temple to learn more! More Chaos! More Chaorruption! More... EVERYTHING! Return to The Span this Friday to learn more! Very long ago but not so far away, Galanoth slew the Dragon of Time. Very little is known of this creature except that it is vital to your existence... and Lore's. Why did Galanoth slay it and what does its death mean for you? Battle through the TimeVoid across the back of the Vaxt Ahas, the Un-Ending, to find out this Friday! J6's To-Do List: "Space Snake." Check! Battle-scarred and wise, the Dragon of Time would have taught you much. Dragon of Time? Wait... what?! When Galanoth's blade struck true, he slew the Eternal Dragon of time and destroyed everything... creating the void. A vast empty wasteland of nothingness. Reality was literally, uncreated. They say mortals could not comprehend what happened next. I beg to differ. I think if you looked inside that slain Eternal Dragon you would find an shattered Hour Glass where his heart should be. The Hour Glass would be bleeding out the sands of time on the floor... but before the last drop of sand fell, ending everything. Someone (or more likely... someTHING) must have noticed that there was not one hourglass in that Dragon's chest... but three! Quibble Coinbiter Returns to Battleon Friday! Quibble has traveled many light-years and alternate-timelines to bring you this gear straight from your past, present, and future! You can see a partial list of what he'll be stocking in this Design Notes post! 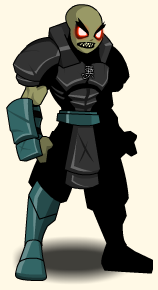 We'll have more previews of the rest of Quibble's inventory later this week. 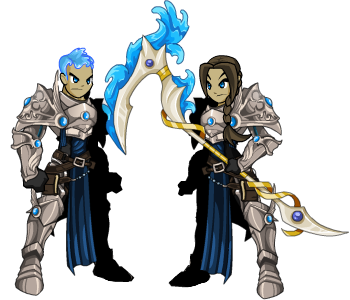 Technomancer and Dravir Armors from DragonFable! Dark Caster Class Release Planned for Friday! Cysero and Yorumi have designed the skills for the incredibly offensive, single-target Dark Caster Class... and now Dage is working on its art. We WANT to release the Class this Friday. Barring unforeseen obstructions to that, we will. Remember, you must have the ORIGINAL Dark Caster Armor to unlock the path you'll take to get to the Dark Caster Class. Dage's evil mind is feverishly working on the details of just what price you'll have to pay to get it! We'll announce more details once they're finalized. The Lorelympics Shop Leaves Now! Originally, we announced that the Lorelympics shop would be up for a week. In the spirit of fostering healthy competition, and because so many of you asked nicely, we left the shop up until the end of the Olympics. That was yesterday, and so down it comes today. Yorumi's Quest to Crush Bugs Continues! The lag has been better recently - but BETTER isn't GOOD ENOUGH! Yorumi has a list of things to try which should hopefully help reduce lag... or show us what else might! He also fixed one very colorful chat bug over the weekend and another earlier today. With your help in reporting the botters and cheaters who break the game, we will continue working hard to make AQWorlds the best game it can be! We are very, very lucky to have so many players who want to make the game safe and secure for ALL players. For that, we thank you. You might have noticed that you haven't heard much from Cysero recently. While the rest of the team and I have been hard at work creating your weekly releases, Cysero has been pushing on some MUCH needed updates to the game. These should hopefully improve your in-game experience. * He'll have more details about his projects tomorrow! * But are not gameplay functionality. Guilds is still in progress, as are new tradeskills. PS: More news about the war and rewards tomorrow! SkyGuard Returns with MORE Chaos! Bombs away! Hunker down in a bunker, Members! This week calls for a /disguise if you’re going to figure out the Master’s latest scheme. Be careful, though; after the Master infiltrated the SkyGuard High Command in his last plot, his thirst for Chaos has only increased! From what your intel officers say, Chaos is in the air, and things are looking Beastly! Wait... WHAT?! Chaos Beast?! DUN DUN DUN! They're new... and from YOU! This weekend we've released more items in the Player Suggestion Shop with new weapons and pets all suggested by players just like you! We have removed the color-custom Barodragon Helm from Yulgar's Suggestion shop and refunded everyone who bought it their 85 AdventureCoins. If you bought it, the helm is no longer in your inventory and you have your ACs back. PLEASE remember: We LOVE putting your suggestions into AQW, but they have to be YOUR ideas. Not something someone else created. That's illegal, and is called plagiarism. Thank you to everyone who reported it! But I don't think the player suggested the helm maliciously. It's easy to see why he likes the helm's appearance; it's awesome art! Just too bad someone else made it first. We don't like it when our art is stolen, and we don't like using someone else's art without permission. New War Items, Changes to War Announcements! NEW news about war items! 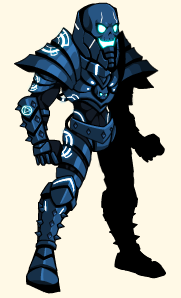 Should the Nulgath Nation win the war, they will unlock the: Legacy of Nulgath Armor, Helm, and Cape! See this image for a partial preview. The shop unlocked by The Sword of the Legion will open in the ShadowFall map at some point in the future. Please remember: NO tweets about items coming in the war are final until they appear in the Design Notes. * Errors happen and we fix them as fast as possible. Sometimes too fast. Hopefully you've got a version of the blade you can enjoy now! ** Thanks to Zukei for pointing out we didn't clarify this! Now Available: 900 AC Package for $4.95 USD! Dage vs Nulgath Print at HeroMart! Head to HeroMart.com NOW to get your limited edition, hand-signed Dage vs Nulgath print! This deluxe, limited edition print is available RIGHT NOW! Measuring 17" x 11" inches, the print features Dage the Evil as he takes on Nulgath for control of the Underworld. Designed by Dage the Evil and Diozz, there are two editions of the poster for sale: a standard print and LIMITED autographed version! 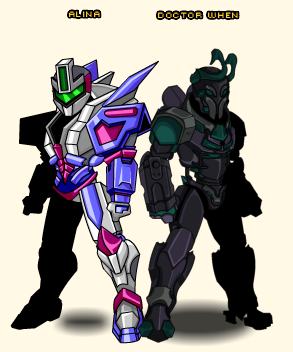 Each print includes two sets of armors, helms, and weapons to /equip in AQWorlds! Both Dage the Evil and Nulgath will sign 500 prints, and once they are sold out, they’ll be real-life rares! Frame your print and then log into AQWorlds to help your favorite Evil Commander send his rival down in flames! I've got family in town to do wedding things. The countdown ticks ever closer. I'm going to head home to take them out to enjoy this fine Florida night. Enjoy the release and all the epic gear! This is what you're fighting for, heroes! This war of Evil Commanders has been fueled by the argument of who is Eviller, but also who has the better rewards to entice warriors to join their ranks! (They're Evil and they embrace that. It's good to know who you really are.) So let's get right to showing off the newest gear they've got planned! 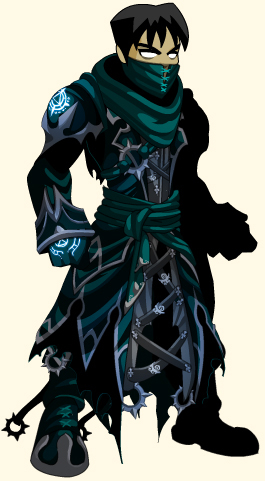 Assassin of the Abyss Armor and Helm! 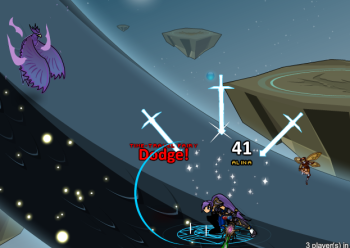 Worshipper Visage of Nulgath (Diamonds), Key of Revontheus Blade (Diamond or AC)! What does it take to make a war? The more content we put in our releases, the happier you guys are! But that also means the room for errors raises exponentially. We correct glitches (like the infinite gold Unidentified 13 glitch) as soon as we find them. We prefer a working game to a broken one, and we think most of you do, too. For OFFICIAL announcements of what's coming in AQWorlds, read the Design Notes! (You've already found them, so you're one step ahead.) Anything not said here is NOT finalized for release. It's an idea, a thought, a "would this be cool?" * Note this for the following section on Guilds. Past, present, and future gear collide in Quibble Coinbiter's backpack! AQWorlds' very own time-traveling sales moglin arrives in Battleon next Friday, August 17th, but he won't be there long, so you'll want to dig through his chest of never-before-seen-slightly-used items and rares while you can! Most of his items will cost AdventureCoins, but as the past few shops have, we will include gear for both members and non-members, as well! All of the equips are modeled on art from our current Chaos zone, The Span. 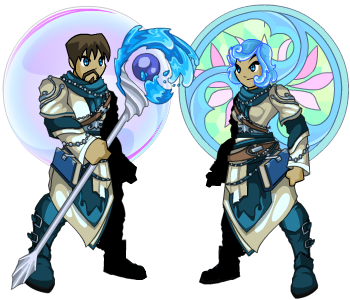 Each of Quibble's newest items were inspired by gear from the original AdventureQuest, DragonFable, and MechQuest! What happened the to The Sword of the Legion's shop? The Sword of the Legion should have unlocked The Stranger's shop. Due to a miscommunication, that shop in the /evilwardage map is open to all players. To fix that error, Dage will create a special shop in Shadowfall just for those loyal Legion soldiers who kept their blades close by! Chaos gets Beastly in SkyGuard! That Master... something about him just ain't right. His growing paranoia - and a bit of help from a friend in the last release - make it easy for you to infiltrate his hidden bunker. Once inside, you'll need to find out just WHAT he's planning, but beware! He hasn't given up his goal to embrace Chaos! Keep an eye on him, give him a hand, and maybe you'll find out just what his plans are! /Hone your blade and your wits, because the Master is a puzzle wrapped in an enigma locked inside a steampunk-prison! Dage vs Nulgath War Update! The Nation continues to crush the Legion, but Dage's undead soldiers are just DYING to even up the war meter! The Worshiper Visage of Revontheus and the Key of Revontheus will be added for Nulgath's followers. Dage's warriors will see a new armor and helm coming! Expect those later this week. Battle On, brave heroes! Victory is yours to take! * Dage has been out of the Lab, sick for most of the week. Once he's battled that bug and back in the Lab, we'll add that new gear! Head to HeroMart.com NOW to get your limited edition, hand-signed Dage vs Nulgath print! This illustration of Dage’s all-out invasion to control the Underworld pulls you straight into the battlefield… and our 11x17 limited-quantity print makes the BEST war-loot! NOTE: We are still waiting to receive the signed prints back from Nulgath, so there will be a small delay on shipping ONLY signed orders. Coming the August in AQWorlds! Return to The Span to see WHY Galanoth had to slay the Dragon of Time! Journey to Shadowfall to aid Empress Gravelyn! The time for inaction is past! Uncover the TRUE nature of Lore's Clerics! What IS the secret of the Sisterhood of Dishpan Hands? 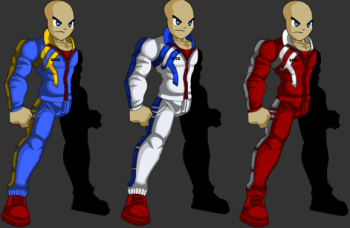 More sporty gear in the Lorelympics Shop! Slash, dodge, and leap your way to Battleon because the Lorelympics shop has been updated! All-new gear celebrating Lore's oldest sports competition are now in-game and ready for equipping. Will you skewer skeletons with your javelin? Bash baddies with your brand-new discus? Dage vs Nulgath War Finale continues! The clash between two of Lore's evillest commanders continues! Over the weekend, Nulgath's Nation pulled ahead on the war meter 38% to 14%! Undead Legion, are you going to stand for that? Nulgath Nation, will you let them regain control of the war meter? The battle continues, and the rewards will keep coming! Later this week, both Nulgath and Dage will put 2 new items into their war shops AND each has decided on what they will offer to their followers if their side wins! Remember: all of the war content going rare will still be available for TWO weeks once the war meter hits 100%! That will give everyone a chance to farm. Coming this week to AQWorlds! Members, grab your steampunkiest gear and /join skyguard because the Master has a NEW plan, and it involves many monsters, crazy Chaos, and he'll need the help of his most trusted recruit to pull it off! ... And that's YOU! Infiltrate his not-so-well hidden bunker and see just what he's planning... and what Drakath intends to let him do! Evil vs Evil... which Commander is greater?! This weekend, your battling will decide whether Dage the Evil or Nulgath the Archfiend gains control of the Underworld! Choose to fight with the Undead Legion, the Nulgath Nation, or for yourself... no matter which side you choose, you'll get awesome loot! 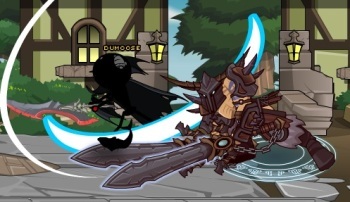 Will Dage rise as Nulgath’s shadow falls? That is up to you and your fellow warriors! Epic Duel's Mechachillid Bug Warriors Invade AQWorlds! It's time to FIGHT! For your RIGHT! To SLAUGHTER! (Your opponents) /join Evilwar and get slayin' because both Dage and Nulgath say it's time to END this war! Have an EVIL weekend, we'll see you all Monday!